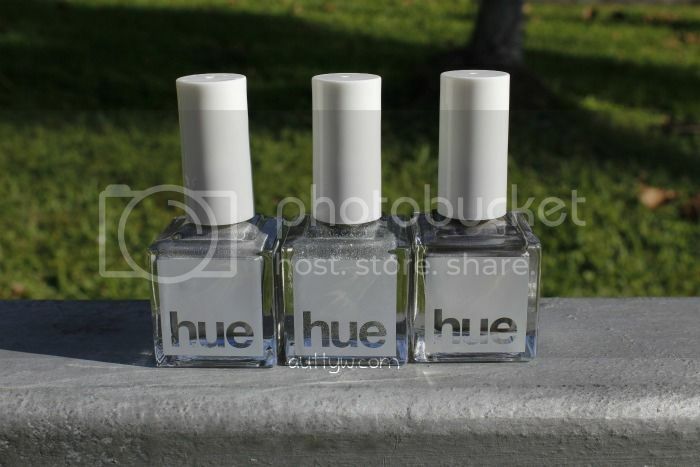 AuttyW: Rock the 2000s with SquareHue November 2015! Rock the 2000s with SquareHue November 2015! The theme for November's SquareHue box was the 2000s Decade. I wasn't really sure what to expect from this collection honestly, so I was surprised that two out of the three polishes were named after major tragedies that happened in the United States. I guess, I will explain more with each polish. I like that there was one color theme through the whole box, it makes it feel...complete? Whole? I'm not sure, there is just something solemn about it. 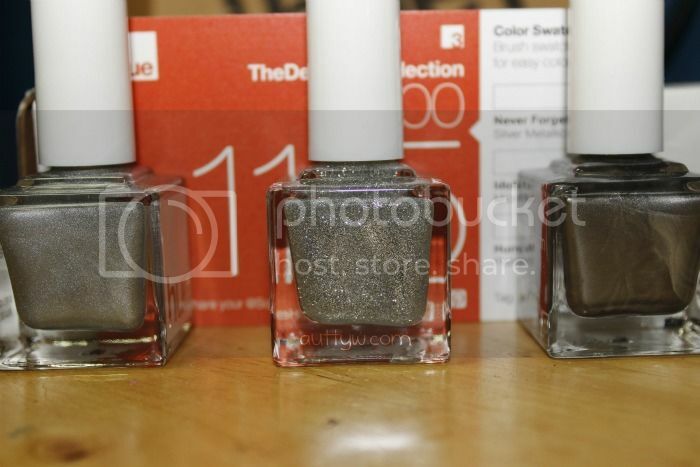 The polish that you see below is aptly named Never Forget 2001. I'm sure that you all can instantly see what this polish was named after. The September 11th attacks. 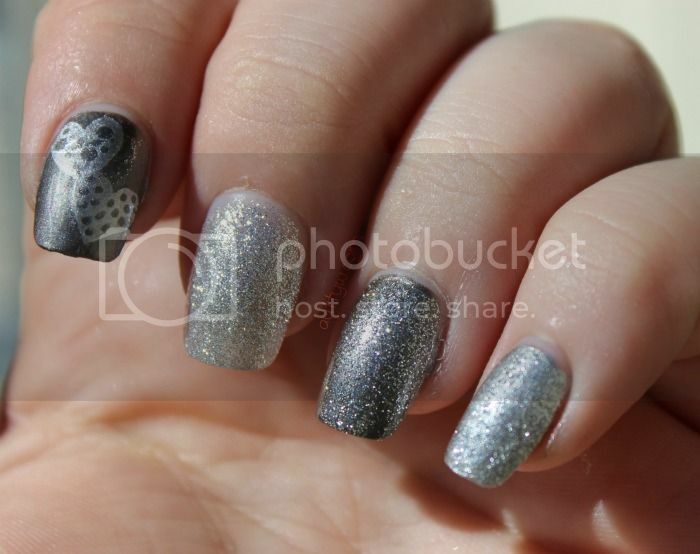 This polish is a metallic silver polish that is opaque in two coats. Just like with all..or well most metallic polishes, you can see the brush strokes with the polish. The pinky and ring fingers are without topcoat so you can see the polish in all of its natural beauty and my index finger has a top coat on it, not that you can really tell. BUT regardless, this is a really nice polish even though it's named after something super depressing. Idol 2002 is named after you guessed it...American Idol, which first aired in 2002. So, as you can tell I have 4 fingers (I mean I really have 10 but don't tell anyone, our secret.) and they are all different. Let's pretend that my index finger is invisible because we will chit chat about that at the end after the swatches. My middle finger has 3 coats of Idol by itself with nothing under it. Pinky Finger has 1 coat over Idol 2002. This is a silver glitter polish and like a typical glitter polish is a pain in the big ol booty to remove, but the effect is worth it in my opinion. I didn't find that this polish had much of a sparkle to it, it's pretty but it's nothing that is like WAH-BAM in your face like some of their previous glitters. It still is pretty though! This last polish is Hurricane 2005 which is aptly named after Hurricane Katrina. Another absolutely devastating disaster that happened. This is a dark steel gray..silver? polish and it can be opaque in 1 coat if applied semi-thick, but if you apply it thinly, you can get it opaque in two coats. Once again, my index finger is the only one with a top coat so you can see the polish in all of it natural glory as well as with some extra shine. I would call this polish a satin maybe? It wasn't matte but it wasn't shiny either. The one thing that I noticed with these polishes is that they dried rather quick. I've found that a lot of SquareHue's polishes dried quickly, but since these are metallic polishes, they dry just like other metallic polishes. I decided that since they dry quick, I would throw my hand in at stamping again. I know that I am terrible at it, but I wanted to try anyways to show that these can be used for stamping. My results are below. If you want to sign up for squarehue and get your own box head over too http://squarehue.com/ and sign up! Don't forget that they offer two boxes now, one that has all 3 polishes and one that only has two. Same collection, just one polish short. I do like the manicure you created, but I do think its weird that they named the polishes after tragedies! Two words: Depressing, and SpongeBob. A few more words: Your swatches look great! Idol is soooo gorgeous, I have been wanting a glitter silver like that for ages. Your stamping came out great too!